“What did you do in the war, Grandma?" is the clever title of a website hosted by Brown University, among others, which documents the lives of Rhode Island women during World War II, featuring the archive of a high school oral history project. It's also an important question that doesn't get asked enough in our own family histories. As genealogists we tend to focus on the very important contributions of our male kin who risked their lives during war time. But the role of women, both on the home front and in the theatres of war, is often overlooked. World War II affected everyone, both male and female, and to better understand our ancestors' lives during that time, we need to consider all of our family members. What did your grandmother (or mother, aunt, great-grandmother) do during World War II? Chances are she worked. With the absence of large numbers of men during the war years, women stepped in to fill the needs of private and government employers. Some women joined the military and served in groups like the WACs (Women's Army Corps), WAVES (Women Accepted for Volunteer Emergency Service), SPARS (US Coast Guard Women's Reserve) and WASP (Women Airforce Service Pilots). These women held military jobs ranging from nursing and clerical positions, to pilots. Most people think of Rosie the Riveter and the slogan “We Can Do It" when they think of women during the World War II era. 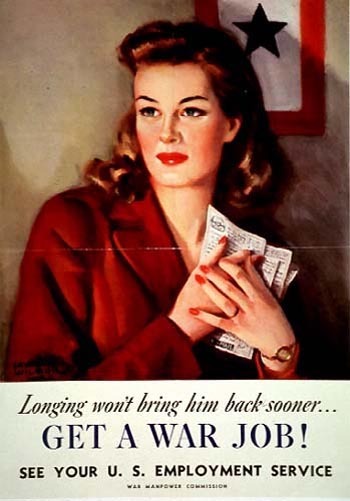 Propaganda posters urged women to find employment and not sit around wishing their sweetheart was home. Many women answered that call to work in airplane manufacturing and shipyards but they also filled the need for workers in other sectors as well. Working women were fulfilling their patriotic duty and were needed in order to ensure a successful conclusion to the war. So what did grandma do during the World War II years? In a word, everything. Just like her mother before her during World War I, women filled in the gaps that men left as they marched to the battlefields. She was in the factory building planes for the war effort. She was working at traditional male jobs pumping gas and working for the railroad. She was also entering jobs via government efforts to make up for the loss of “man-power" such as the Women's Land Army, which matched women with agricultural jobs, to fill the gap left by farmers who went off to war. The program, which debuted during World War I included "an estimated three million women, or 27 percent of the entire agricultural labor force, in June 1943. "[v] Women also continued working in traditional “women's work" jobs like waitressing, cleaning, teaching, clerical work, and providing childcare. Once the war was over many women went back to their housework, usually because they were forced out of their jobs to make way for returning soldiers. They may have left the workforce to concentrate on their families, but the pride of a job well done never left them. As the members of the Greatest Generation pass away, we lose those stories. I, like so many others, have lost the opportunity to ask my grandmothers what they did during the War. By the time I realized I should ask, they had already passed away and no one in the family knew that part of the story. Wondering what the women in your family did during the War? Start with home sources and interview family members, then search city directories for her name and possible mention of her occupation. Look through local newspapers for want ads and articles about how women were contributing to the war effort. Local histories might also provide clues to life during World War II. The women in your family history have an important story to tell. Their many contributions to sustain the home front during times of war are too often overlooked. Research their lives, discover their stories, and share their pride in the valuable contributions of the women in your family tree. Gena Philibert-Ortega holds Master's degrees in Interdisciplinary Studies and Religion. She is the author of hundreds of articles published in genealogy newsletters and magazines. Her writings can be found on her blogs, Gena's Genealogy, and Food.Family.Ephemera. Her latest book is From the Family Kitchen (F + W Media 2012). Follow her on Twitter @genaortega. [i] "RESEARCH STARTERS: AMERICAN WOMEN IN WWII." The National WWII Museum. Web. Accessed 23 Aug 2015. <http://www.nationalww2museum.org/learn/education/for-students/research-starters/women-in-ww2.html>. [ii]Women's Bureau. Handbook of Facts on Women Workers. Publication. Washington D.C.: US Department of Labor, 1948. Bulletin No. 225. Fraser. Federal Reserve Archive. Web. P. 3. Accessed 23 Aug 2015. <https://fraser.stlouisfed.org/docs/publications/women/b0225_dolwb_1948.pdf>. [iii] Women's Bureau. Handbook of Facts on Women Workers. Publication. Washington D.C.: US Department of Labor, 1948. Bulletin No. 225. Fraser. Federal Reserve Archive. Web. P. 1. Accessed 23 Aug 2015. <https://fraser.stlouisfed.org/docs/publications/women/b0225_dolwb_1948.pdf>. [iv] "More Married Women Working than Single Women." Biloxi Daily Herald 11 Dec. 1944: 7. Findmypast. Web. Accessed 23 Aug 2015. <http://search.findmypast.com/search/us-and-world-newspapers/page/view/184415139>. [v] Litoff, Judy Barrett, and David C. Smith. “To the Rescue of the Crops." The Women's Land Army during World War II." Prologue 25.4 (1993): n. pag. National Archives and Records Administration. Web. Accessed 26 Aug 2015. <http://www.archives.gov/publications/prologue/1993/winter/landarmy.html>.